Vivaldi browser stable version 1.7 ships with a new feature called Capture page. 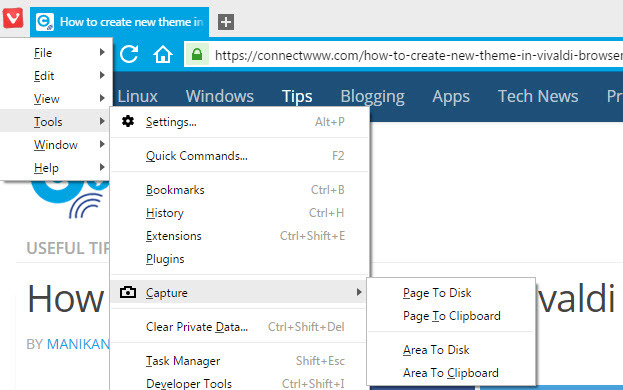 Using this feature you can take screenshot of a full page or a selection of a web page. You can also choose whether you want to save it on your disk or store it to clipboard. This new feature can be useful for less technical users to take screenshots right from the Vivaldi browser. To capture a page in Vivaldi, first update your vivaldi browser to the latest stable version. that is vivaldi 1.7 and later. 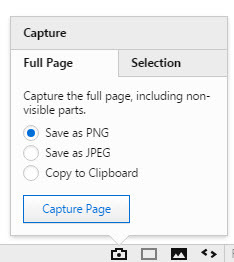 Then click the vivaldi menu and select Tools, then select the capture menu. There are 4 options available to select now. They are Capture page to Disk, page to clipboard, area to disk and area to clipboard. You can also easily access the capture option from the camera icon from the Status Bar. Just click on the camera icon, it reveals a small pop-up window that shows all the available options for taking a screenshot. 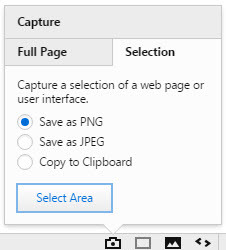 Currently you can save image as PNG and JPEG.